Washington Nationals starting pitcher Stephen Strasburg returned from the 15-day DL on Sunday to face the Cleveland Indians in his first start since injuring his oblique in a May 31 start against the Atlanta Braves. 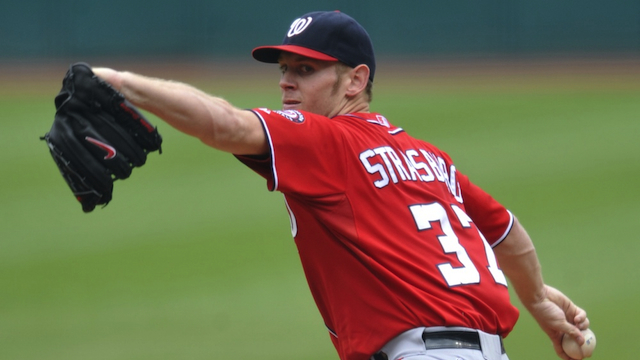 Strasburg worked five innings, surrendering just one run and one hit, along with four strikeouts and four walks. Strasburg was held to just 82 pitches and was pulled after the fifth inning as precaution in avoiding a potential re-injury of his oblique or other complications. Strasburg, although allowing just one hit, did not have good command of his fastball, as he walked two of the first three batters that he faced. He was unable to effectively locate his fastball and did not possess the typical poise that is displayed by the Washington phenom, but due to the fact that his stuff is at a plus level, he was able to get himself out of a couple of jams in the first and fourth, and pitched 1-2-3 innings on three separate occasions. Strasburg acknowledged his command issues, but felt confident in his first start back from the DL. Despite a decent outing by Strasburg, the Nationals were unable to muster up any offensive run support, as Cleveland starter Corey Kluber pitched eight scoreless innings and struck out nine en route to a 2-0 victory for the Indians. Both teams now sit second within their respective divisions with the exact same record of 34-34. Cleveland has won only four of their last ten games, while Washington has won five of their last ten.